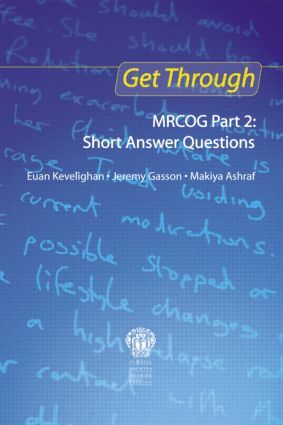 Get Through MRCOG Part 2: Short Answer Questions is an essential revision guide for candidates preparing for the MRCOG Part 2 exam. This comprehensive collection of practice Short Answer Questions (SAQs) is designed to help candidates test and assess their own knowledge, aiding thorough preparation for the exam. The book opens with an introduction to the exam and includes advice on how to prepare for it, information on what to expect, and guidance on how to write excellent answers. This is followed by two sections: the first provides a wide range of SAQs divided into obstetric and gynaecological topics, and the second presents six practice exams set out in the format of the actual exam. For each question, the authors highlight the key words in the question, followed by a brief essay plan and then give a worked example answer. The specimen answers indicate how many marks the candidate would obtain for each point made, and are supplemented with valuable extra information and further reading, to enhance understanding and aid further revision. I would thoroughly recommend this book if you are preparing for the MRCOG Part 2 exam. There are over 200 pages full of useful advice and how to approach the exam as well as 100(!) essays to answer. Each essay has a "key words", "essay plan" and "suggested answer" section with a mark allocation. The answers are all referenced showing that they are accurate and up to date.